I remembered once I used 《An art explorer with talent and diligent》 as the title in one of my articles introducing Cui Zimo and his works. Till now, I still feel that is very suitable to him. Talk about “talent”, his abundant knowledge background of science, engineering, and arts are the irrefutable profs, not to mention the laudation of “A genius over the past five hundred years” by Wen Huaisha, a Chinese literary giant. Some people might think that is a little bit too much and went to ask Master Wen, while Master Wen said in high tone: “oh yes, I am regret, I should have said ‘over the past one thousand years”. “Diligent”, that is something people admire to have. Zimo seldom went out, but “practice asceticism” at home. He wrote books, articles and did a lot of researches, even worked his heart out. When he was too tired to write, he would stand up to draw on the wall to practice the energies on wrists. After long time of practice, his wrist force is unbelievable. With no aid, he can draw absolutely straight lines of one meter by suspended hand position. After tired in drawings, he would go back to write. Like this, he forgot to eat and sleep, even to drink a sip of water. A brilliant artist must reach the state of selflessness to achieve something. Such as Cui Zimo, who rigorously and grimly sacrificed most of his entertainment and happy time with families to realize his art accomplishment. Cui Zimo is a little bit like a “monk”. He painted flowers and birds in meticulous way at early time and copied many Buddas relief frescos in Dunhuang. He also copied classic line drawings as 《Chao Yuan Picture》. 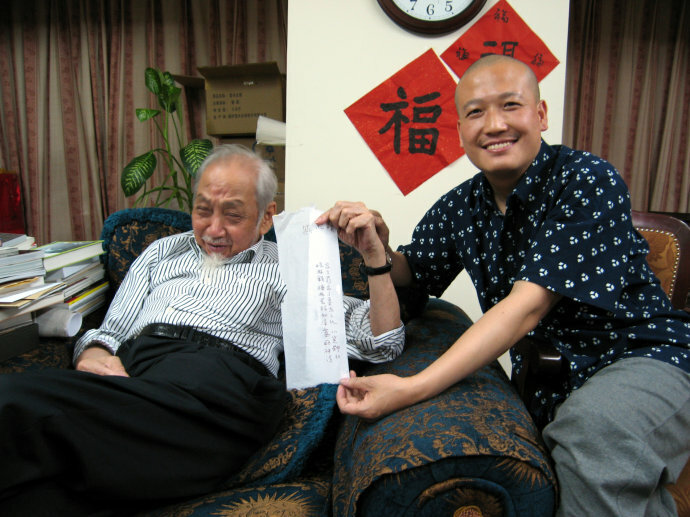 He made his time to make samples of Zhangcao fonts to be used in the computer. He also wrote long scrolls of calligraphies about a hundred meter’s long, and the 《Four Books》 (most acient Chinese books). I like his paintings of lotus very much. They are of millions stances by various skills. I like his small paintings of mountains and rivers, which can expresses landscapes in thousand miles away, with mist and clouds, magnificent momentum. I also enjoy his oil paintings as well as paste pictures, photos which all can give people different esthetic feelings. The highest level of art is about accidental as well as inevitable, familiar as well as unfamiliar. Zimo draw some “boxes” casually in his paintings, just like the focus box of a camera. He said: “it was just because of these boxes, I can lead audiences’ visions, blur and clear inter-woven together. At this moment, audiences’ deeply buried memories can be woke up and radiate boundless vitalities. From then on, this enlightment of evalutation can be considered as an experience being spread out and stimulated continually and added up. It can be a new tool to recognize and reappreciate the Nature which we took for granted before”; “it deepens on each level, it is the cycle of vision. Space and time, conflicted, blended, compound and derivate. The spaces in these works are multidimensional because they came from thoughts”. The beauty, dynamic and process of these thoughts can be also seen very clearly in Zimo’s works called “Scriptism”, because those are traces left from his thinking movements. “Tiny and vastness”, “vacancies and stillness, all things emerge and shall be seen from its origins.” The obvious charms of esthetic in Zimo’s “visual field” combines tradition and modern, eastern and western, forms and spirit, emotions and reasons. I do have images of Zimo creating his new works in my brain. He was not in cold mind and was unruffled by emotion. He was intoxicated in his drawings, and carried away by the “visual field” which he created himself. He was assimilated by his “visual field”, and in the near future, his audiences may also be assimilated when appreciating his new works and experiences his feelings during creation. 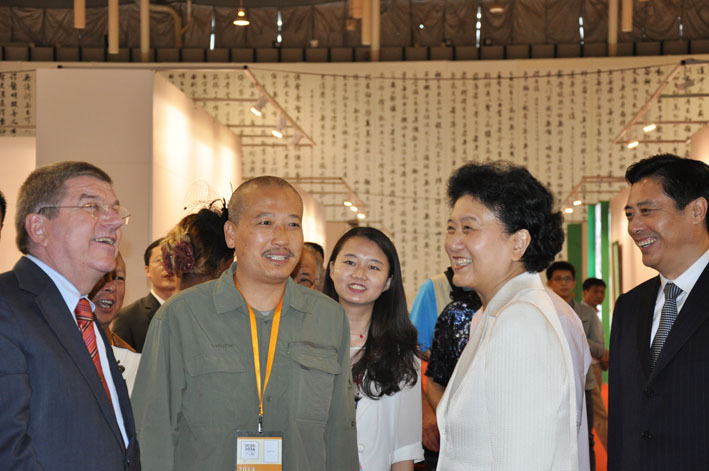 Cui Zimo used to give me the impression of calm, intellect and stable, seldom sensitive, impetuous and jumping in minds. But in his new works of 《Visual Field》, I found Zimo’s natural and free instincts with refined expectations. 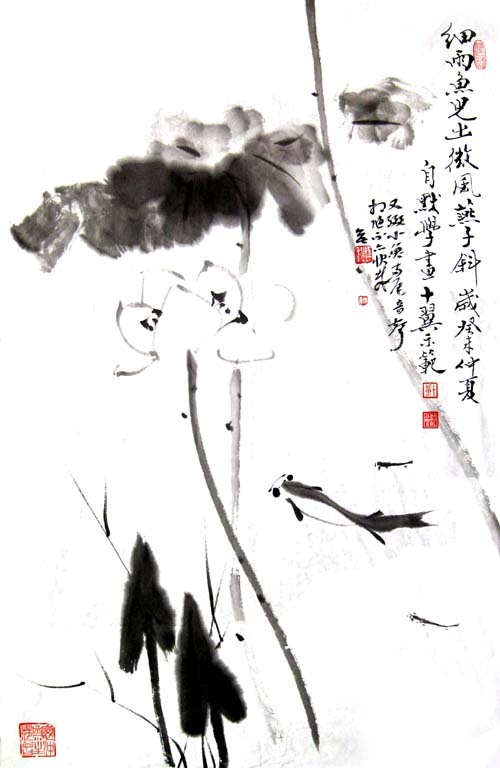 Of course, in his previous calligraphies, mountains and rivers paintings as well as people and flower and birds paintings, we can also find this spirit or character. Zimo said: “now, I felt something deeper, something exists as Chaos. It is not totally disordered, either totally dynamic, It is a relative movement, ‘move as not move’”. That is the static in the dynamic and dynamic in the static; reality in the vanity and vanity in the reality; something in nothing and nothing in something. With his brushes, Cui Zimo started a new journey of exploration. “What do I want?” ――The title on one of his exhibition catalogues offered such a meaningful question. In deed this question is what the artist asked himself, it shall also be the question that asked by his readers themselves.